CUZCO, Peru, Apr 28 2008 (IPS) - Thousands of varieties of potato (Solanum tuberosum), one of the most widely-eaten and well-known foods in the world, have been developed in the heart of South America’s Andes mountains, where the crop was domesticated more than 8,000 years ago. Justino Zuta harvesting potatoes. Credit: Milagros Salazar/IPS. Peru is home to the world’s biggest germplasm bank of potatoes, containing seeds, tissue culture and plants from 5,000 varieties. The biologists, geneticists and agronomic engineers working with the non-profit International Potato Centre (CIP), which began to collect samples in Lima in 1971, carry out lab and field research with the help of rural communities. Of the 4,500 native and 500 improved or modern varieties preserved by the CIP, more than 2,500 are native to Peru. U.S. taxonomist David Spooner at the University of Wisconsin-Madison determined that all modern varieties of potato can be traced back to a single species that originated in what is now southern Peru, between the south Andean region of Cuzco and the altiplano (highlands) shared with Bolivia, CIP biologist Ana Panta explained to IPS. “We are raising these organic potatoes for our children, our families. 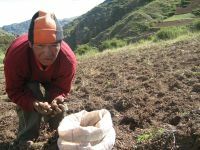 We don’ use fertilisers, only manure,” Mario Paco Gallegos, president of the Paru Paru community and vice president of the Association of Potato Park Communities in Cuzco, the ancient Inca capital, told IPS. Gallegos represents one of the six communities that agreed in late 2004 to work with the CIP to help preserve the crop and guarantee its sustainable use, based on the application of scientific research and the recovery of traditional indigenous knowledge. The agreement gave rise to the Potato Park, where some 10,000 hectares are covered with “layme” or “muyuy” – fields worked communally by indigenous “campesino” (peasant) communities – interspersed with ponds and streams, in the Sacred Valley of the Incas. When IPS visited the Potato Park, campesino men and women from the community of Paru Paru carrying picks and hoes awaited the team of researchers accompanying us: CIP agronomist René Gómez and members of the non-governmental Asociación Andes. The task that brought them together was the construction of a community greenhouse for the preservation of seeds. The Potato Park is home to 1,200 families – some 6,700 people – according to the Asociación Andes. IPS and the other visitors were shown a kind of open air germplasm bank under a bluish roof. Between 620 and 640 varieties of potato are planted at altitudes of 3,950 to 4,400 metres above sea level, Gómez explained. Around 410 of these were “repatriated” from the CIP gene bank after being cleaned of viruses and pests. Gómez, the curator of the CIP’s potato germplasm collection, pointed out the difference in productivity: the seeds cleaned of viruses can produce up to 18 tons per hectare, compared to just six tons for traditional campesino crops, and a national average of 12 tons per hectare. The Potato Park uses a crop rotation system, allowing fields to periodically lie fallow to recover soil fertility. According to the United Nations Food and Agriculture Organisation (FAO), potatoes are grown on 600,000 small farms covering a total of 260,000 hectares in Peru. “We have the responsibility to protect the world’s largest collection of potatoes,” said CIP director Pamela Anderson in Lima. “This task is ongoing and will not end, and also involves the dynamic conservation of the crop, through our work with rural communities. “The idea is to return their potatoes, their treasure, to them so that they can preserve the crop’s biodiversity,” she told IPS, stressing the support received from the Italian government in particular. In the last five years, the CIP has “repatriated”, virus-free, 25 percent of the native varieties of potato from more than 30 highlands communities, said Anderson. The CIP is like a museum that conserves varieties of the seven original species that began to be domesticated 8,000 years ago, as well as 150 kinds of wild potatoes, their ancestors, in test tubes, cold chambers and even the fields, said Panta. Centuries of food history are displayed in trays on a table, with potatoes of all colours and shapes – blue, purple, yellow, red, gold, russet, speckled, round, clustered, long, oval, pear-shaped – identified by their traditional names in the Quechua and Aymara languages, alongside their scientific names. The native names are as colourful as the potatoes themselves. One bumpy, cluster-like potato is known as “pusi qachun waqachi” or “makes the daughter-in-law cry”. Native potatoes in Peru come in at least nine different colours. But the differences go beyond skin-deep, and also lie in their flavour, the way they are used, their nutritional value and their resistance to different kinds of weather conditions. Some have drawn the attention of the world of haute cuisine, as exotic ingredients, and have been used in international exhibitions because of their flavours, such as last year’s MadridFusión07: V International Gastronomy Summit in Spain, which showcased the Peruvian potato as one of the world’s seven most important ingredients. The nutritional value of the potato is also celebrated. FAO has invited chefs and cooks from around Latin America to share original recipes in which the potato is the basic ingredient, as part of its Chefs Against Hunger programme. The recipes will be published in the programme’s first International Cookbook, one of the activities planned for 2008, declared the International Year of the Potato by the United Nations. Boiled, stewed, roasted, fried, dried, mashed, grated, stuffed or converted into flour, potatoes have been adapted to culinary traditions all over the planet. They are the fourth-largest staple food crop in the world, after maize, wheat and rice, with annual global output amounting to more than 323 million tons. The potato is rich in several micronutrients, especially vitamin C and vitamins B1, B3 and B6, and in minerals like potassium, magnesium and phosphorus. Its protein content is also very high in comparison with other roots and tubers, according to the FAO, making it an important food source for the poor in Peru. But while the potato still forms the base of the diet of impoverished highland Indians, consumption of potatoes in Peru has dropped over the last 30 years to 120 kilos per person a year to just 65. The government, which has set itself a goal of bringing that total back up to 100 kilos per person, is promoting the baking of bread with potato flour. Private companies and supermarkets are also offering more and more potato products in attractive packages, like flakes and specially selected and packed fresh potatoes of a wide range of native varieties. Farmers say potato crops are feeling the effects of climate change. This year, unusual drought and snowfall patterns hurt production in many areas. In addition, “diseases and pests are spreading as the climate warms up. Our potatoes used to be healthy,” said Paco Gallegos, who pointed out that farmers are planting their crops at higher and higher altitudes, to avoid the heat. Diversity is important in that respect, because some varieties are more resistant to certain climate conditions than others. “In this harvest, our production is insufficient,” Justino Zuta, “varayoc” (traditional leader) of the community of Pampallacta, told IPS worriedly as he harvested “Compish” potatoes with the help of his four-year-old son Rosinaldo. He pulled several worm-infested and tiny potatoes from the huge heap that he had dug up over the course of a 12-hour workday. Potatoes can contribute much more than they already do “to food security on the planet,” he added.